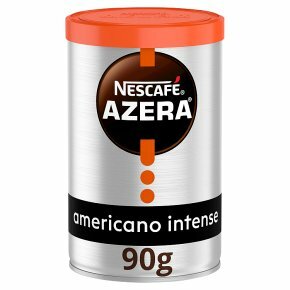 NESCAFE Azera Intenso: An inviting blend of instant coffee and finely ground roasted coffee beans, delivering a full bodied flavour and an intense aroma. A rich roast with an irresistible layer of velvety coffee crema. Stimulate your senses. Be your own barista with this premium instant coffee. Crafted using a blend of Robusta and Arabica coffee beans. A combination of instant and finely ground roasted coffee. Experience a velvety crema with every cup. A full-bodied coffee with an intense aroma. Enjoy an exquisitely crafted coffee moment with NESCAFÉ AZERA Intenso, our full-bodied instant coffee made with a carefully crafted blend of Robusta and Arabica coffee beans. 1) Add 1 heaped tsp (1.8g) into your favourite mug. 2) Pour in 200ml of hot (but not boiling) water. 3) Enjoy your barista-style coffee.